Classic Mortal Sin Band Concert Posters and Memorabilia! Buy Online Now! Mortal Sin were one of the first Australian thrash metal bands to achieve widespread recognition outside of the land down under. Inspired by the genre’s earliest champions (especially Metallica and Anthrax), vocalist Mat Maurer, guitarists Paul Carwana and Steve Krstin, bassist Andy Eftichiou, and drummer Wayne Campbell caused quite a stir with their excellent 1987 debut, Mayhemic Destruction. Considered a minor thrash classic in its time, the album even had mighty Kerrang! Magazine touting them as the ‘next big thing,’ but their 1989 follow-up, Face of Despair (released by major label Polygram and introducing new guitar player, Mick Burke, supplanting Krstin), fell somewhat short of expectations; its superior production values were incapable of masking the mostly lackluster songwriting within. 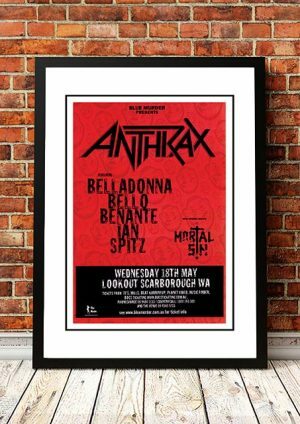 In retrospect, it’s clear that creative stagnation had already set in, and despite opening for Metallica‘s Aussie tour later that year, and touring with Testament and Faith No More across Europe in 1990, the band’s warring factions wound up splintering, following a disastrous benefit gig back in Sydney (fans destroyed the venue — to the benefit of no one). With its musicians now scattered to the four winds, the book appeared to have closed on Mortal Sin‘s brief career, but bassist Eftichiou covertly set about assembling a new lineup that featured vocalist Steve Sly, guitarists Tom Dostoupil and Dave DeFrancesco, and drummer Nash Hall. It was only a matter of weeks before his outraged former bandmates got wind of his plans and initiated legal proceedings to strip him of the right to use their collectively-owned name, but not in time to stop the release of a third, obviously very dubious Mortal Sin album in 1991’s Rebellious Youth. A six-year silence ensued for hatchet-burying purposes, but original members Maurer, Eftichiou, and Campbell did eventually decide to reconvene Mortal Sin with the aid of guitarists Anthony Hoffman and Troy Scerri, and recorded an EP entitled Revolution of the Mind. Since its release in 1997, Mortal Sin have continued to reunite for the occasional concert, but no actual new recordings have surfaced. We stock some awesome Mortal Sin Band Concert Posters.